It may appeal to enterprise professionals and Windows diehards, but is that enough? Ask a smartphone fan what their ideal phone for 2015 might be and the answer would likely be a 2K screen, top-end processor, 3GB of RAM, removable battery and microSD slot. With the Lumia 950 XL, Microsoft has taken this list and run with it, adding even more features, like liquid cooling, and even the ability to sort of run like a fully-fledged PC. Every cloud has a brown lining however, and the Lumia comes with something that will count as a massive caveat for most: it runs Windows 10 Mobile. As one of two standard bearers for Redmond's latest reboot of its ill-fated mobile efforts, the XL has a lot riding on its shoulders. Unfortunately for the folks at HQ, the results are something of a mixed bag. At the Windows 10 launch event the twin Lumia devices shown served as something of an afterthought, only getting a few minutes of exposure each; now we know why. Unlike an iPhone 6S or Samsung Galaxy S6, which feel like jewellery, the Lumia 950 XL abandons the originality of its Lumia design legacy to embrace an aesthetic that can best be described as...Travelodge chic. The oddly placed buttons are sharp, the sides feel flimsy and the back shows some signs of flex. Here the signature Lumia matte plastic often feels cheap rather than practical, even if the removable back can come in handy. At 8.1mm thin and weighing in at 165g however, the handset is at least mercifully easy to handle, which is impressive given the 5.7-inch screen. As is becoming the norm on higher-end Lumias, there is of course a camera 'oreo', evoking the Lumia 1020, along with an unusual triple-LED flash. The back really goes all out to sell the camera capabilities from first glance, while attempting to distract from the less than premium finish. Ever taken your smartphone out of your pocket and thought “man, if only this could help me be even more productive?” If so, Microsoft has you covered with the 950 XL. With a special dock, a keyboard and a mouse (both preferably wireless), the Lumia 950 XL can do its best impression of Windows RT on a large monitor with the new 'Continuum' feature - although all these accessories come at an additional cost. The potential here is great, even if the execution isn't quite there. Only core Windows apps specially optimized for the task can be used, meaning that checking email and editing the odd word document are really the limits at the moment. It has always been a “it's so crazy that it just might work” kind of idea, but the people at Redmond have really cottoned on to something here, even if it is just a bit of a gimmick at the moment. Microsoft has also seen fit to include another slightly controversial element: a USB-C port for fast charging and data transfer. Though it might prove for gains in the future, it nonetheless proved to be more of a nuisance than anything else, as at this moment in time the only USB-C cable we have is the one that comes in the box. Leave the cable at home and you'll be without a means to charge your phone - it's unlikely your friends will have one knocking about. Windows Phone has built a reputation for smooth performance. Helped by many (sometimes excessive) animations, it can run on functionally anything. Certainly the likes of the Lumia 520 and the 930, two much older handsets, mostly run at an equal pace. As such, with 3GB of RAM and an octa-core 64-bit Snapdragon 810 processor on board, the Lumia 950 XL feels overpowered, if such a thing is possible. Both the UI and demanding apps flow, slide and open without a hitch. Matching the specifications of phones like the HTC One M9 and the Nexus 6P was always going to yield great results, but here it can't help but feel like Microsoft was preparing the hardware for things to come. If there is one thing that Joe Public knows Lumias for, other than shocking orange plastic - their camera performance. The line has a reputation for imaging excellence, one that that the 950 XL proudly upholds, beating the likes of the Moto X Style and even the LG G4. Pictures produced had an almost filmic look to them, with rich colour, excellent detail resolved and a surprisingly good dynamic range. Moreover, the 'Rich Capture' technology included makes shooting complex scenes as easy as pressing the shutter button, with the phone doing most of the work. For anyone even vaguely acquainted with past efforts, Windows 10 Mobile is mostly very intuitive. The endearing live tile set up is still the best way to take in 'glance-able' information - for those new to smartphones it probably the easiest ecosystem to understand. Despite the easy set-up, the operating system still really shows signs of its infancy. Bugs and crashes were very common, and annoying. Plus, for those moving from Android or iOS the layout of Windows 10 Mobile on the Lumia 950 XL is likely to confuse and frustrate. The lack of applications in the store also means the Lumia 950 XL struggles to offering a compelling casual experience, with the apps on there often poorer version of their Android and iOS cousins. Luckily the screen goes some way to redeeming the 950 XL. With a 'Clearblack' polarisation filter, sunlight visibility is great, and with a pixel density of 518ppi along with the sheer size of the panel make watching videos and reading longform articles a treat for the eyes. Windows Hello, the in-built iris recognition feature intended to replace your pin, is also a treat, that is when it works of course. Microsoft has labelled the product as a beta, meaning that this will improve with time. Generally we found battery life to be ok, if nothing more, lasting around a solid day in normal use. If you're more frugal with your usage you may be able to squeeze a day and a half out of the Lumia 950 XL, but you'll still want to charge it every night. 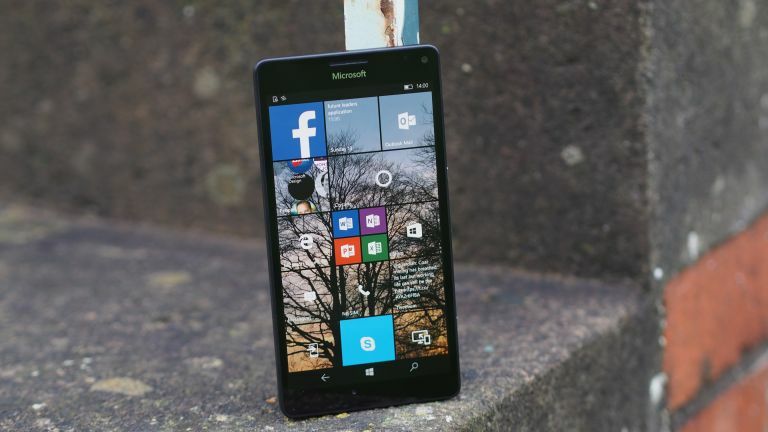 There is great potential here, with a strong camera, a lovely screen and several interesting new features, the Microsoft Lumia 950 XL is certainly different to anything else on the market. But whether you can live with the device is dependent on two things: your tolerance for bugs and your attitude towards apps. With a cheap build and only average battery life, the hardware isn't perfect. If you can buy the Windows 10 vision, this is the handset for you. If however, you want a head-turning flagship, you'd be best to look elsewhere.